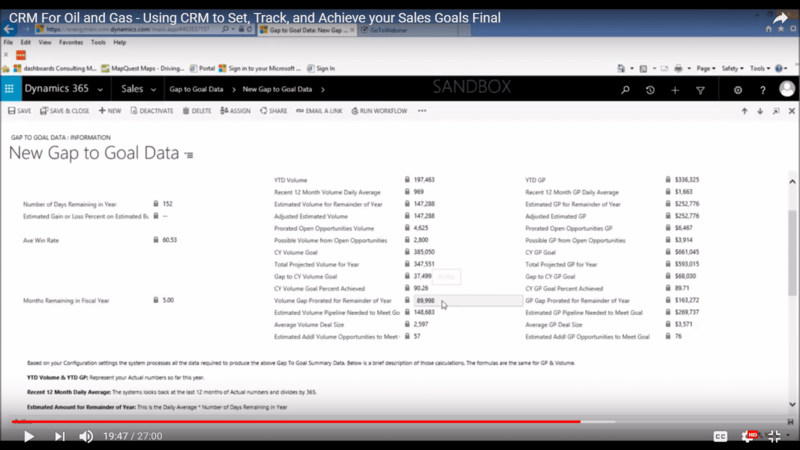 After you have decided on your goals as a team and documented them in an Excel Spreadsheet, it’s very easy to upload them to your CRM system. 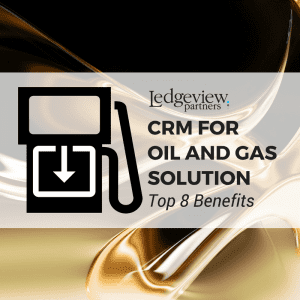 With Ledgeview’s CRM for Oil and Gas Solution, we provide tools specific to the Oil and Gas industry to meet day-to-day and long-term demands. When you upload your goals into your CRM system, CRM will load all of your configuration settings to make sure your spreadsheet is valid. You will be directed to a screen that prompts you to enter the start and closing dates of your fiscal year, then browse the system, find your spreadsheet (typically a CSV file), hit next, and verify your spreadsheet. If any errors come up, the system will alert you to fix them. Once you hit next, it will finalize the loading process. Where do your goals go from there? Navigate to some dashboards to see where your company is going or see how your sales team members are doing individually. You will see a blue bar showing you how well you’re doing with Gross Profit, and four circles to represent your quarterly goals. These goals are set granularly. 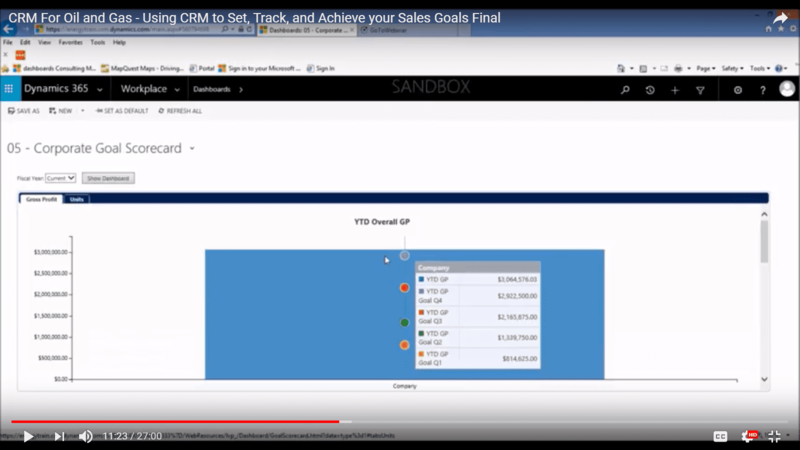 At the salesperson level, you can see how your team is doing in terms of Actuals versus Goals. Now that you’ve established a good pipeline, goals, and actuals, don’t you think it would be nice for the system to tell you where you’re at and what you need to do to hit your goals? That’s exactly what Ledgeview’s CRM for Oil and Gas Solution will do for you! You can go into your system, tell it what you want to analyze, and how often (daily, weekly, monthly, etc). Make it whatever you want! You can crunch data from your company in terms of Gap versus Goals, focus on departments (Lubricants, Oil, etc), keep an eye on specific salespeople, and even organize by department level. You may choose to get even more granular depending on how you set up your product categories. You may want to organize by brand, for example. You can analyze how each salesperson is doing specific Goal metrics. The analyzation possibilities are (almost) endless! Finally, if you think your business is going to go up or down throughout the year, you can allocate a percentage to that. If you think it will stay flat, you will not change anything, but if you project positive or negative growth, there is that option. The beauty truly comes with the data that’s produced every night (or according to your desired frequency). We know you have CRAZY amounts of data in your system. Reports will show you the date, analysis, numbers, etc. 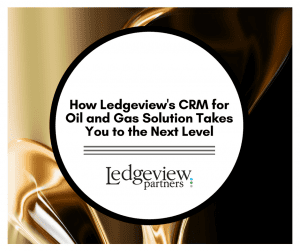 Your CRM for Oil and Gas Solution with Ledgeview will build you an extensive database. Moreover, the screen will tell you exactly when you are looking at data, the types of analyses, departments, and salespeople, plus your analyzation of Volume versus Gross Profit, and more. The true beauty lies in the customization of Ledgeview’s CRM for Oil and Gas Solution. It does all the work FOR YOU! It especially comes in handy for coaching sessions. So, whether you use it daily, every few months, quarterly, or at a different rate, your data is always at your disposal under your pre-defined settings. Whenever you need to know how your buckets are calculated, the data is right there. With using Pipeline Management, Setting Goals, Getting Actuals, and telling the Configuration Record what you want it to do, your work is now over. You don’t have to spend hours and hours of your own time collecting and analyzing data points. If you want to implement a time-saver like this for your Oil and Gas business, contact Ledgeview today! Our experts are eager to get you started with an efficient, organized system that works to save you time and improve the quality of your business practices and workflows. Get more benefits of the solution here. Marketing Coordinator at Ledgeview Partners.